And not just any pizza, some absolute dynamite pizza! So what we talking here? 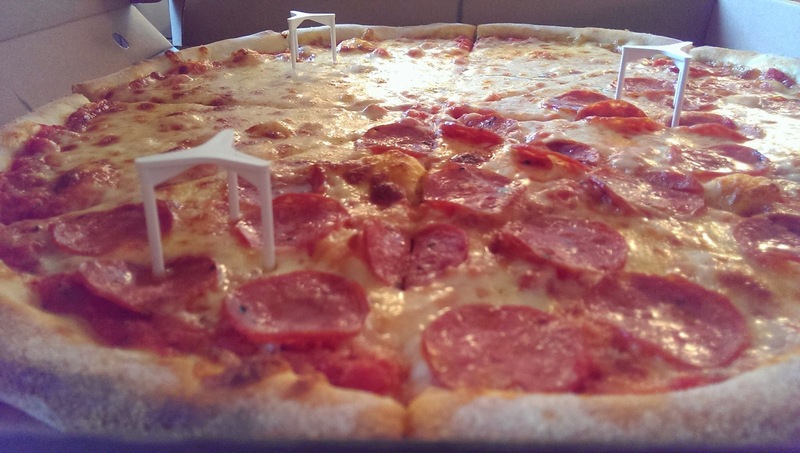 New York and Sicilian stone baked MONSTER pizza pies in 10", 12" and 18 INCHES with tasty, meaty toppings; stringy, creamy mozzarella cheese; and sweet San Marzano tomato sauce. Wings, wedges, calzones and subs; freshly cooked pasta al forno; American desserts. Extensive, mouth watering and on the money. 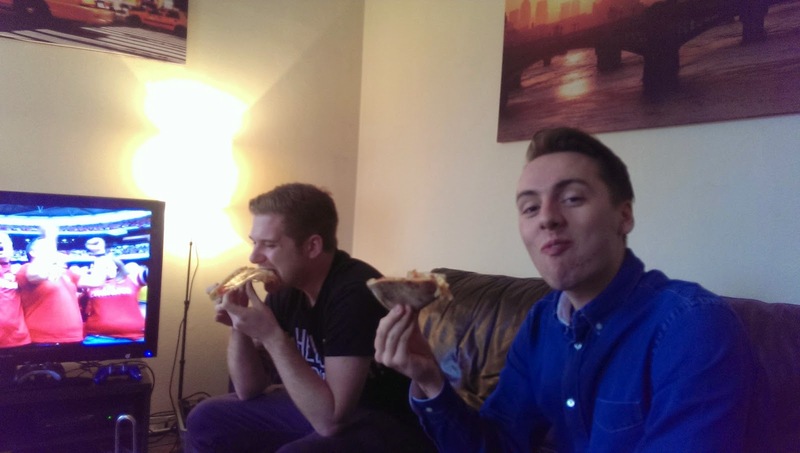 Saturday afternoon: 4 bros, 2 football matches, plenty of beers, big hunger. 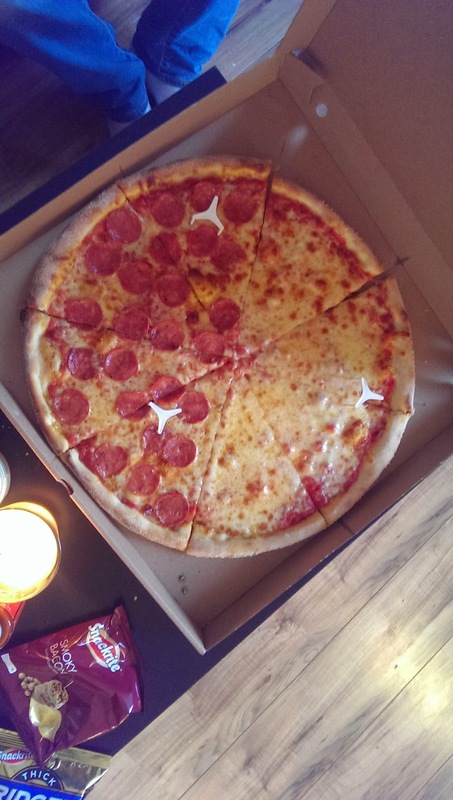 We kept it classic and ordered a BEHEMOTH 18" New York Pizza pie: half Margherita, half Pepperoni. Called our order in around 4, delivery didn't start 'til half 5 but this wasn't a problem and sure enough the pizza was delivered right on time, piping hot and at 18 INCHES... can only be described as A SIGHT TO BEHOLD. Generously topped with creamy mozzarella, spicy pepperoni and a light, flavoursome tomato sauce. 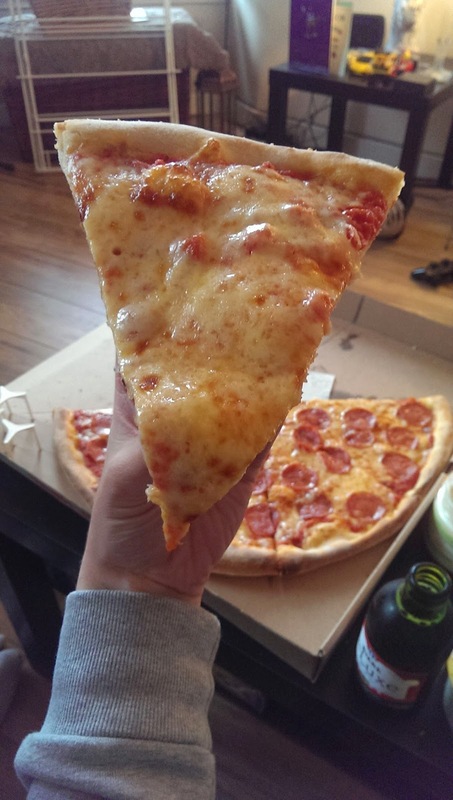 I'll have a pizza this.. The dough is slightly salty to ensure it's not tasteless. 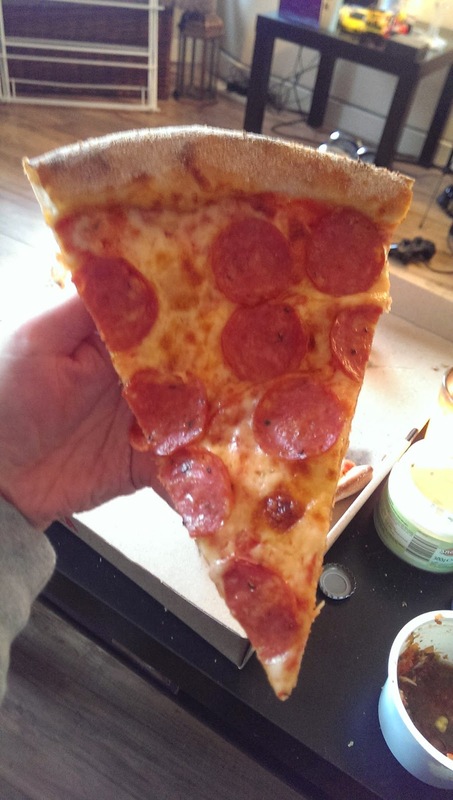 It's crispy on the outside, fluffy on the inside and perfect for dipping; a real treat at the end of every God-sent slice and a true indication of a perfect New York pizza pie that even Lady Liberty would be proud of. If you're wandering down Sauchie blazing some night, treat yourself to a slice of pizza heaven... or go one better and ditch Dommies and give these guys a call to sort you out a delivery and tell them Mr Manwich sent you: you won't regret making the switch. 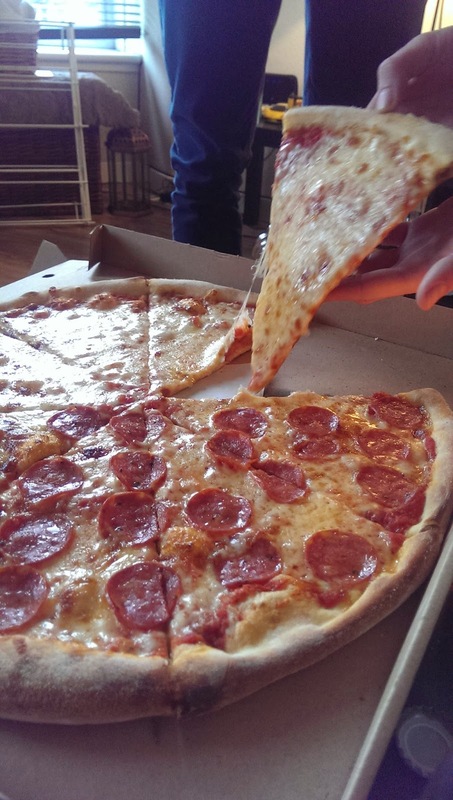 Our tip: pair your NY Slice delivery if with 6 cans of your brew of choice, a bottle of uncle Jack and your bros best banter for a mega night in. 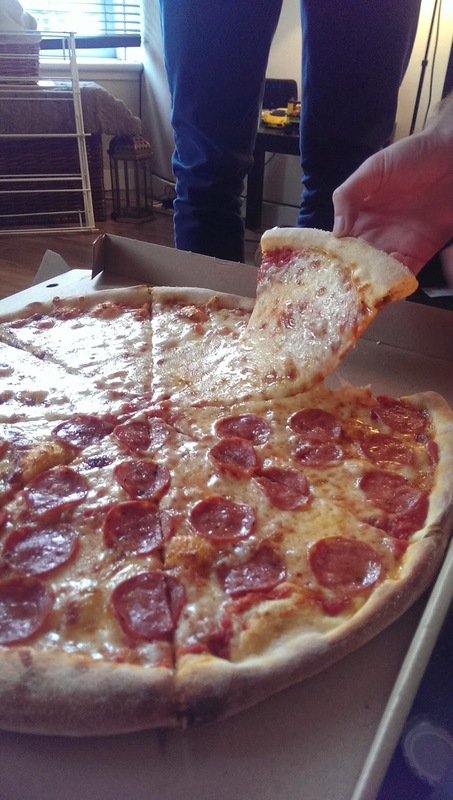 Hit up NY Slice on Twitter (@NYSLICEUK) and Facebook (NY Slice Glasgow) for all the latest news and FREE SLICE GIVEAWAYS! 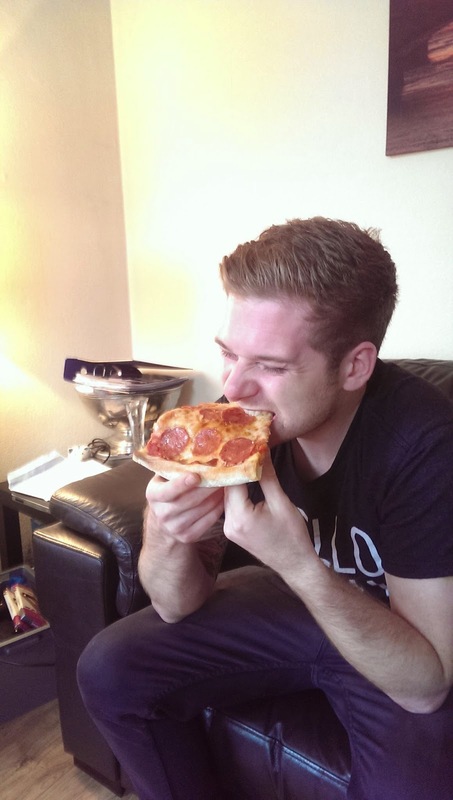 If that's not a happy pizza eater, I don't know what is. 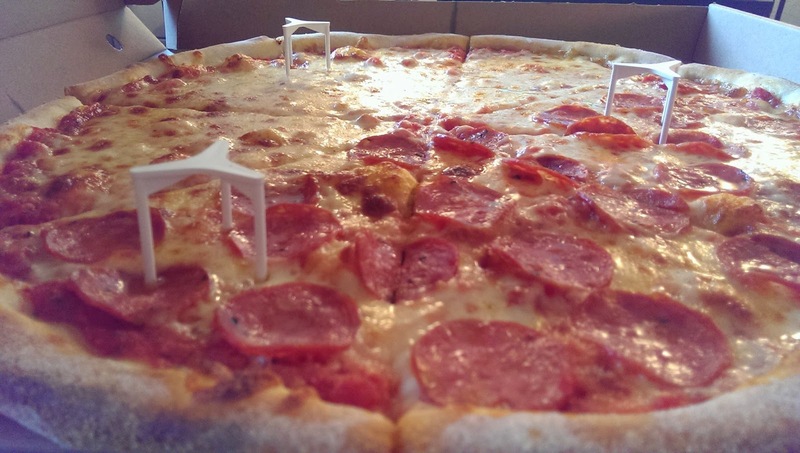 Think you've found a better pizza in town? Hit me up @MrManwich or drop me an email mrmanwich[at]mrmanwich[dot]com! It's no secret, I'm a big fan of Glasgow. 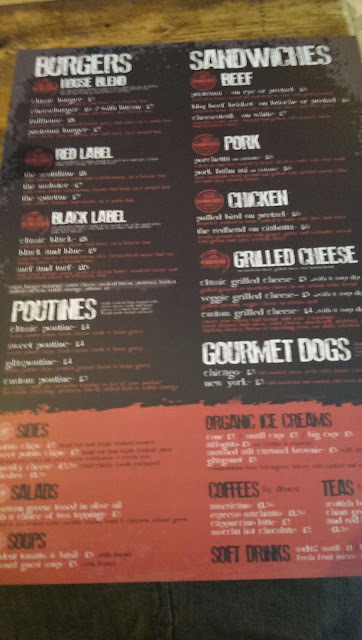 Since moving from Ayrshire to the big smoke a few years ago, I've built up a right strong affinity with streets of "the dear green place", Glesga culchur, the network of bloggers and, naturally, the awesome selection of eateries (and sandwiches!) our city has to offer. Although I've got my go-to places for monster manwiches, gut-busting burgers and burnin' hawt burritos in Glasgow, when the opportunity to explore some place new and find out what's happening on the food scene in another city comes up, I'm there. Over the years, there have been some amazing highlights from my travels out of Glasgow including The Bird in Berlin; The Michigan Diner in Tecumseh, Canada and some other unbelievable food caves in the US, Mexico, and Dubai. Last weekend I was given another chance to enjoy the bright lights and bites of London as more than a Big Ben gawping tourist, rowdy Scot at Twickenham or doting graduate job applicant. Venturing south to visit my sister would also give me the opportunity to drop in on a few places I'd heard about online currently serving up some mean grub to hungry Londoners. Bubbledogs on Charlotte Street in Fitzrovia was somewhere Hannah had heard some cool things about over the last few weeks. 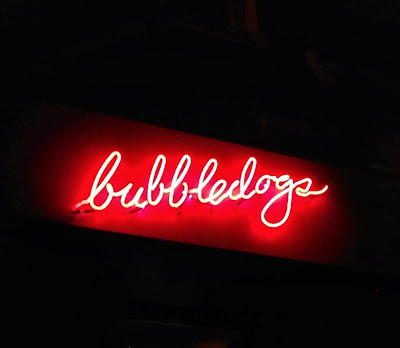 A champagne bar that is doing things a little bit differently, @bubbledogsuk dishes up some of the dirtiest dawgs I've seen this side of New Yoik to accompany the bubbles by the glassbottle. 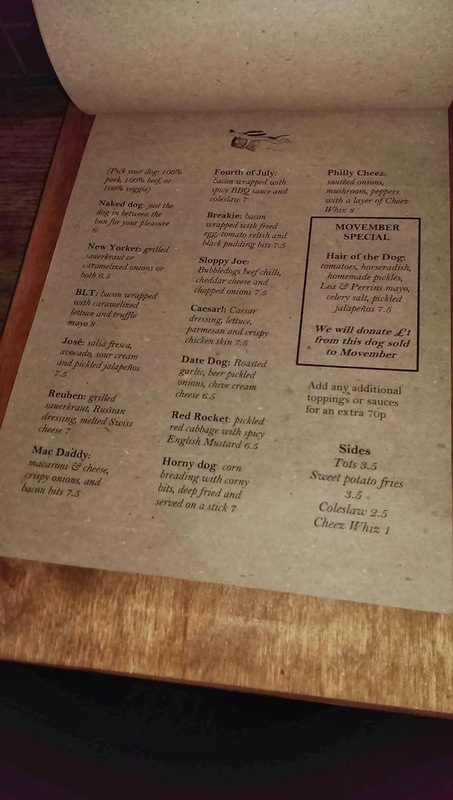 The Bubbledogs hot dog menu is pretty extensive, actually, offering three different types of sausage (100% pork, beef or veggie) and 15 different mouthwatering topping combinations. Mixing up classic ingredients such as onions, sauerkraut, and spicy jalapeños, with date destroying roasted garlic, crunchy caramelised lettuce, and Asian red bean paste, Bubbledogs makes selecting a dirty dawg from the menu quite difficult! Stand out combo options for me? The "Jose": salsa, avocado, sour cream and jalapeños, and the "Breakie": your dog topped with fried egg, tomato relish and black pudding bits. 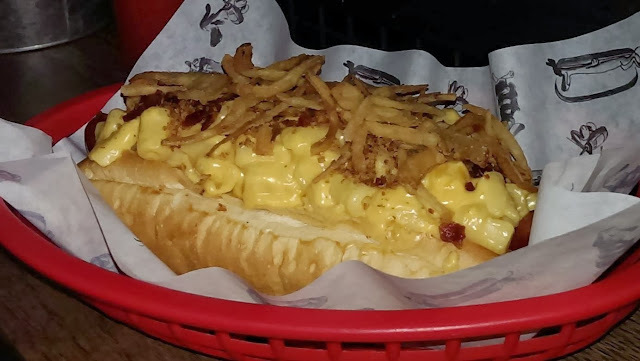 After much deliberation, Hannah opted for The Mac Daddy: 100% meaty pork sausage topped with rich, cheesy, cheesy mac 'n cheese, bacon bits and crispy onion strips. The bun is soft and doesn't disintegrate as a result of the sauciness of the indulgent cheese sauce. The sausage is firm, meaty, smoky, delightfully cooked, giving that slight crunch with every bite that only a freshly cooked dawg can. The macaroni is generously layered on top, the pasta isn't over cooked and mushy, and the sauce is creamy, cheesy and sumptuous. Bacon bits add smoky, saltiness and the crispy onion strips add another texture to satisfy an increasingly inebriated diner: it's amazing how quickly the bubbles go to your head! 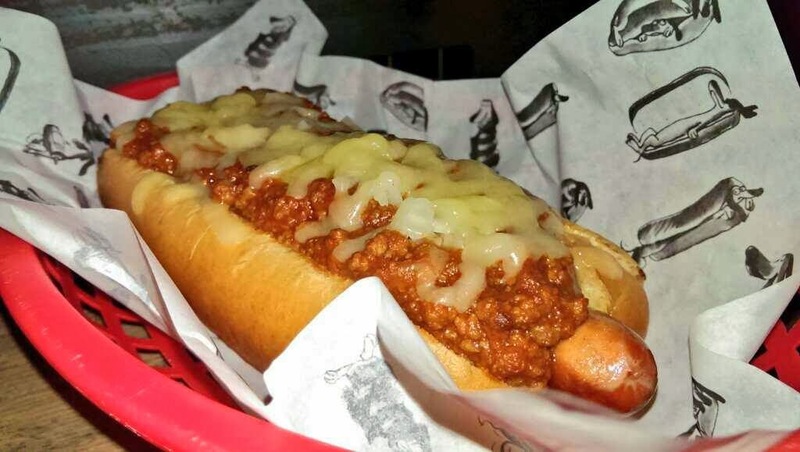 THIS IS WHAT A CHILLI CHEESE DOG SHOULD BE LIKE! Smoky, well seasoned, warming ground beef chilli - not too spicy: not too timid - but piled on like a flowing chilli lava with the crispy fried off onions and stringy melted cheese surfing on top. The dawg itself is perfect: meaty and soft on the inside, firm when bitten, and so, so satisfying. I've been lucky enough to try chilli dogs in the US and this guy has gotta be up there: a perfect example. 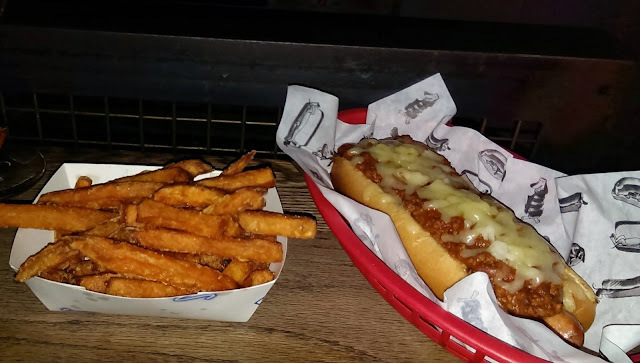 The Sloppy Joe: A perfect example of a chill cheese dog. 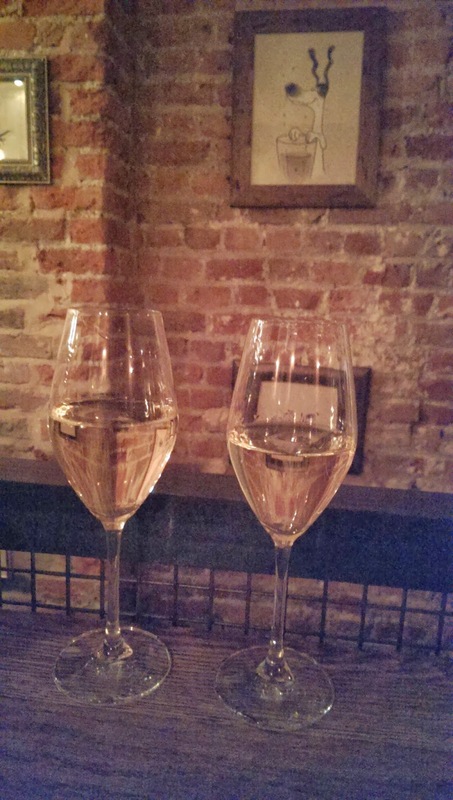 I saw some reviews commenting on portion size @ Bubbledogs, and like others, I like a big plate of food. IMO, the hotdogs were plentiful but if you're heading along and fancy yourself a big feed, add a portion of the deliciously crispy fried sweet potato fries from the selection of sides and you're good to go. Besides, you gotta' leave some room for dat brut, son! Crispy sweet potato fries on the side. 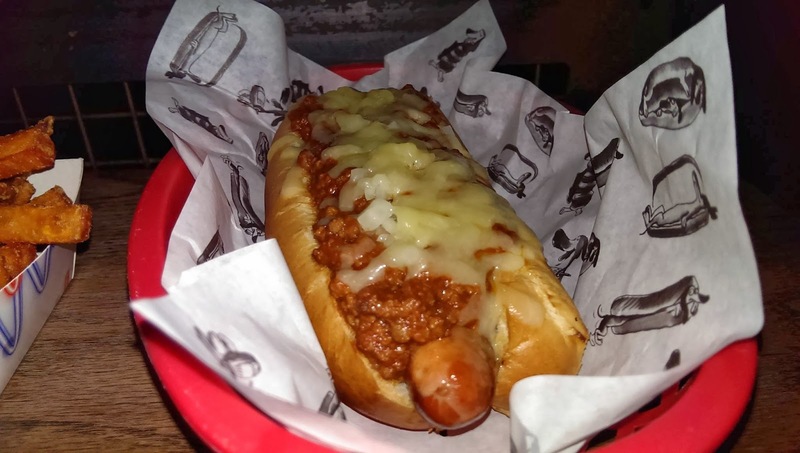 This has got me on the lookout for somewhere in Glasgow, the West or even Edinburgh where I can pick up a chilli cheese dog to rival this one of Bubbledogs! Have you got a suggestion? Or have you been to Bubbledogs? What did you think?! Drop me an email or tweet me with your suggestions: @MrManwich. 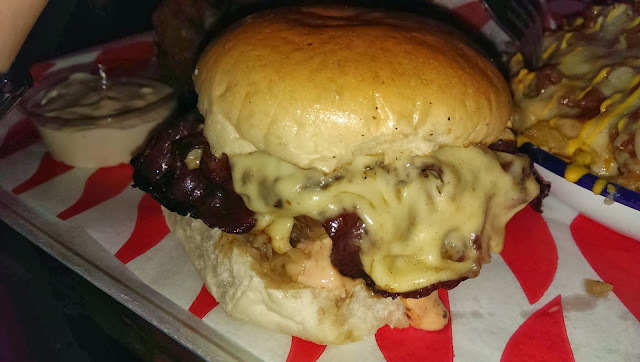 Coming up on mrmanwich.com: MEATliquor, London review. Three years ago I started a group on Facebook to try and convey my love of turkey, bacon, stuffing, cranberry, mayo Christmas sandwiches: The Christmas Sandwich Appreciation Society. A year later, when my beloved Christmas sandwiches reappeared in stores, it was suggested by some members of The Society that I should start a blog declaring my love for all that is manwich: MrManwich.com was born. So where are we now, my sandwich brethren? Thursday past marked the second blogiversary of the date I started mrmanwich.com. I can't say I've posted as much as I would have liked to, but my love for sandwiches and other foodstuffs I would class as a 'manwich', is unfaltering: I've been lucky enough to eat some pretty killer stuff over the past two years including the incredible "Mr Manwich Special" cake at the top and bottom of this post crafted by our very talented family friend, Gillian McGarry, and gifted to me by Mama Manwich for my birthday earlier this year. If anyone would like to get in touch with Gillian (based in Largs) with any bespoke cake enquiries, drop her a line at gmcgarry[at]hotmail[dot]com: her work is incredible. Here's to the next two years of eating! May the manwiches be with you. 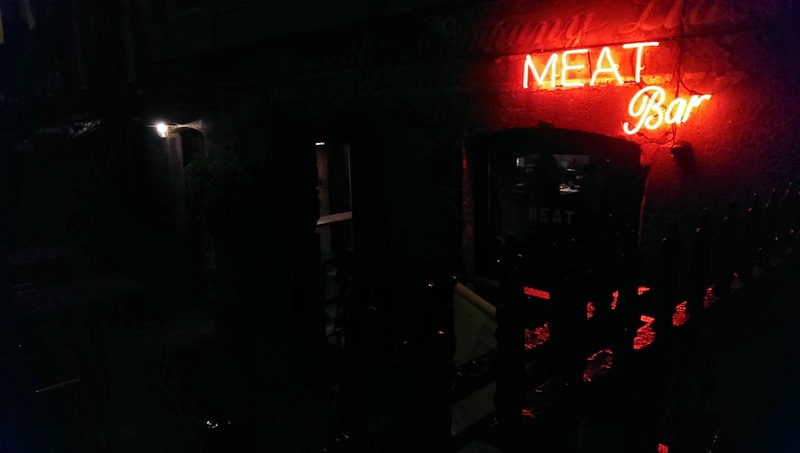 Just this minute in from the pre-launch evening at Bread Meats Bread, the very latest edition to Glasgow's ever-growing list of American dining options (not that I'm complaining!). Thought I'd get my thoughts down on paper while they were still as fresh to death as the Bread Meats Bread potato and brioche buns! This pic's a bit blurry, but I wanted to use it to illustrate the different type of items on the menu so you know what you're in store for when you pay the guys there a visit...because you will. Three different types/levels or meat 'quality' all offered with different toppings which include beef brisket, swiss cheese, bacon, gravy and the other usual suspects. Nice looking left side; prices reasonable; varied selection; ingredient sources clear. But wait second, THERE'S A MOTHA FUDGING BURGER TOPPED WITH LOBSTER!!! I didn't get a chance to try it, unfortunately, but the fact it's offered is something I've not come across until now and a pretty cool take on the idea of surf and turf. I did get to try a sample of each of the different burger types: House Blend (classic ground beef), Red Label (ground beef mixed with Italian pork sausage) and Black Label (premium, aged ground beef), each tasting delicious in their own special way. Hightlight of the burger selection sampled for me was probably the Red Label Spartan burger with tomato and tzatziki. 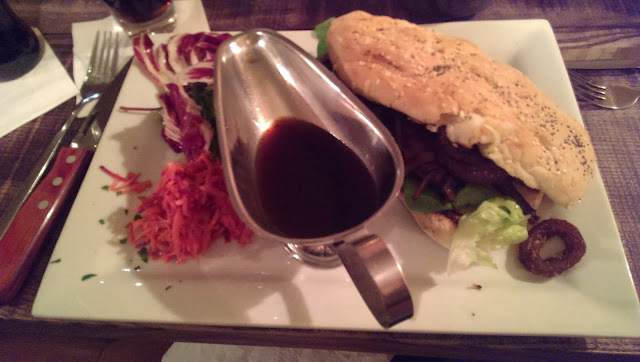 The burger itself was meaty, deep and smoky; accompanying toppings fresh, cool and tasty. A good menu staple for all burger fans. But what about the good stuffz? I'm not saying I'm not 'intae' burgers, right, but those who know me and know this blog know I'm more about sandwiches. The right side of the menu was where the action was always gonna' be at @BreadMeatsBread for me, and the cats didn't let me down! 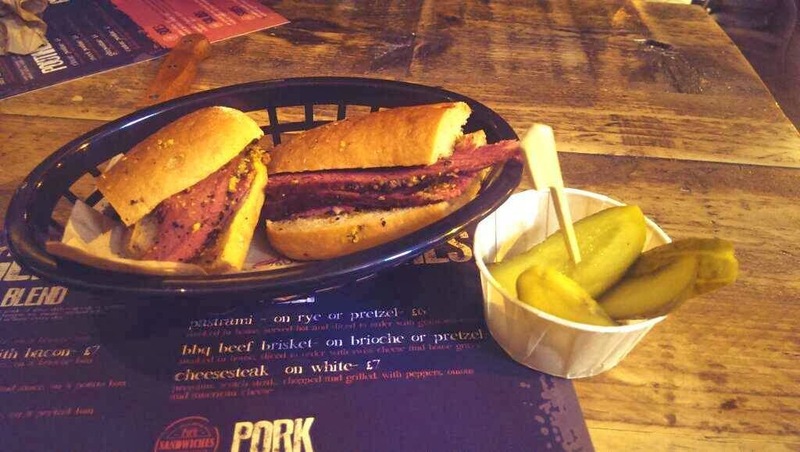 The pastrami, mustard and pickle sandwich on rye was the first #manwich I was lucky enough to sample and the freshness of the meat, bread and pickles blew my mind. 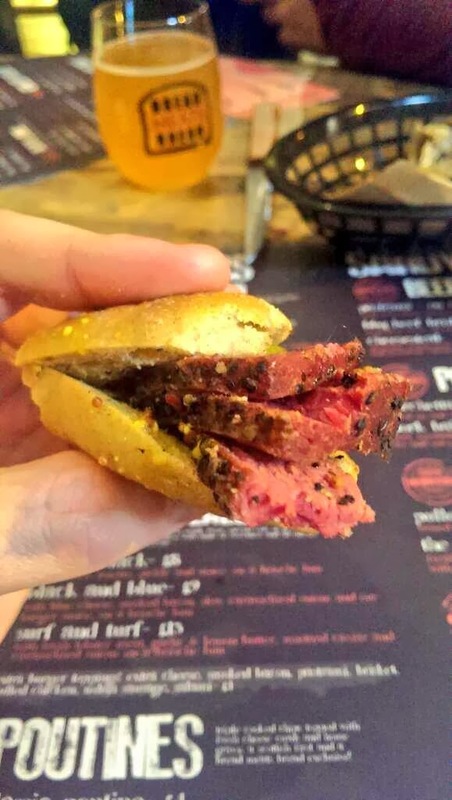 The guys at Bread Meats Bread smoke the pastrami in house and, in all seriousness, it's absolutely phenomenal. The meat is succulent, peppery and deliciously seasoned, but not so smoky that it overpowers the taste of the beef itself. The addition of the mustard and the obligatory pickle to the rye bread was, of course, welcome, and the overall finished offering was sublime. 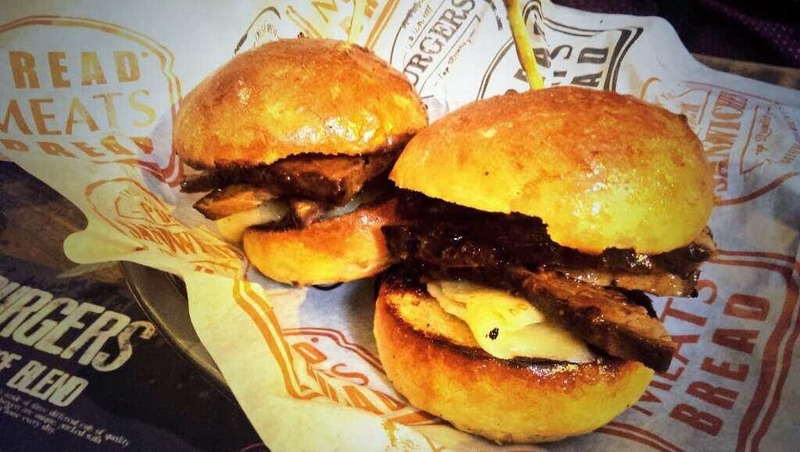 Bread Meats Bread: 16 hour smoked brisket with gravy and swiss cheese on potato bun. I'm struggling to articulate this in any other way, other than that it can only be described as AN OFFERING FROM THE HEAVENS. 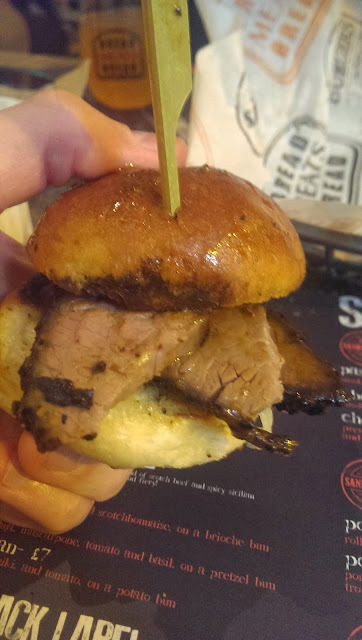 The flavour of the 16 hour smoked meat was simply incredible and the guys have absolutely nailed it with the toppings of melter swiss cheese and smooth, meaty gravy. The toasted potato bun was a fantastic surprise and a brilliantly original idea. If you're struggling to think what it's like, it's as soft as a sesame bun but holds firm, uncrumbling, and tastes like a tattie scone! Awesome, eh?! Best sandwich in Glesga' by a mile; I literally can't get over it. Best sandwich in Glasgow at the moment? Probably. 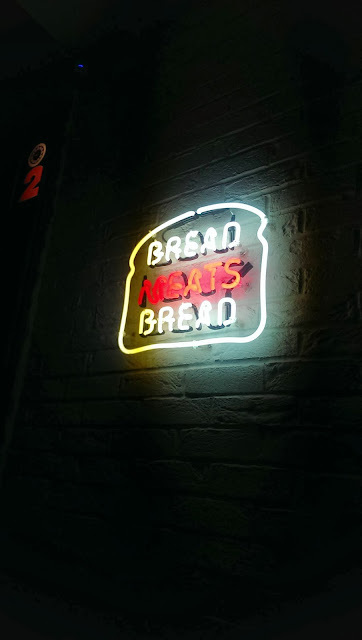 Overall, first impressions indicate that Bread Meats Bread might live up to my hopes and dreams for a sandwich shop in Glasgow city centre that akin to that of the legendary Primanti Bros of Pittsburgh. And the beer selection is good too: Blue Moon and Sierra Nevada the bottles of note. So there you are. Bread Meats Bread meets Mr Manwich. Like the sound of this? Head over to Facebook and give the lads a like for all their latest news. And if you're out and about in Glasgow city centre, drop in and pay them a visit at 104 St. Vincent Street: you'll not regret it. Have you stopped by Bread Meats Bread after reading this? Let me know your thoughts in the comments! Mr Manwich visits MEAT Bar, 142 West Regent Street, Glasgow. It's been a good while since I got round to putting up something on this here blog. Anyway, a really sensational scran popped up unexpectedly on Thursday night and it I wanted to give the folk at MEAT Bar a quick shout out for providing a tasty, hearty feed; accommodating, friendly service; a top-notch in-bar soundtrack of classic & modern rock; and an overall enjoyable after work dinner experience (@Meatbarglasgow on Twitter). "Was it really that good? ", I hear you ask. Well, aye, actually, it wis.
That's exactly what it was: GOOD. Faither and I ordered two manwiches: The Steak Sandwich and The French Dip. 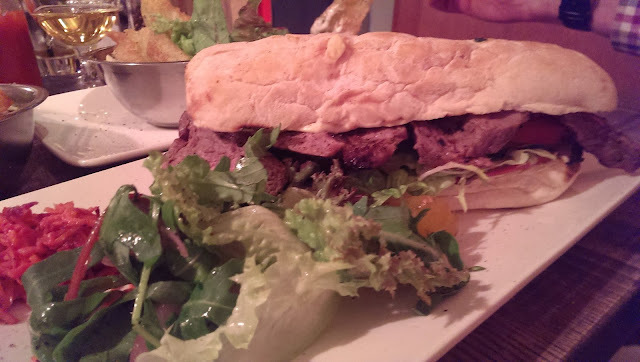 The Steak Sandwich came with a good helping of nicely sliced medium cooked beef: GOOD. A classic combination executed well. The steak itself was succulent and tasty and the accompanying onions and horseradish mustard mayo offered sweetness and a little heat. Winner. Slow cooked brisket: GOOD. Tasty, meaty, sumptuous, flavoursome. Blue Swiss cheese: GOOD. Deep, tangy, not too strong. Grilled onions: GOOD. Sweet and crunchy. Whole grain mustard and horseradish: GOOD. Adding a bit of heat: never a bad thing. Bone Marrow Gravy: WOW. Salty, meaty, silky; brought the whole thing together nicely. 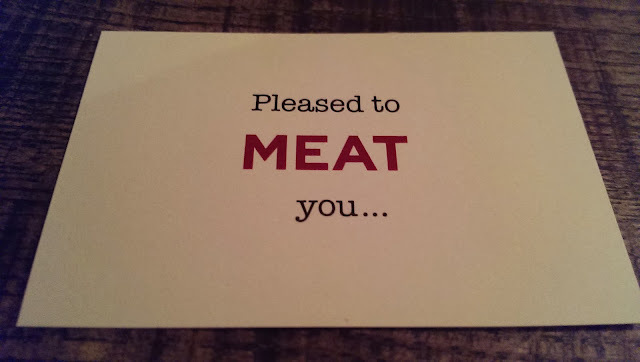 Pleased to MEAT you too, MEAT Bar. Have you been to MEAT Bar? What did you think? Any other recommendations!? Let me know by email (mrmanwich[at]mrmanwich.com) or Tweet me: @MrManwich.